Quit thinking your life, your writing, your kids, your career or your kitchen have to be perfect. What if we simply said, “yes,” right there in the midst of the mess? Yes to the water gun fight, yes to bacon for dinner, yes to impromptu ice cream runs, yes to the neighbor kids coming over – again. I’m starting to believe that the more we get used to saying “Yes” to the small things, the easier those big, life-changing yeses will become. What if we started with just five minutes of writing? Say yes with us today. Give us your best five minutes on the writing prompt – MESS. –>click to tweet. Because my friend Kristen Welch wrote a whole book about how we don’t have to be qualified, we don’t have to be all caught up on the laundry, we don’t have to have perfect kids or a perfect life or a perfect credit score or faith or job to simply say “Yes” to that next thing God is inviting us into. We can say, “Yes” right there in between all the dirty dishes and last night’s gross pot of leftover mac ‘n cheese. Rhinestone Jesus: Saying Yes to God When Sparkly, Safe Faith Is No Longer Enough , is proof that we actually can say yes long before we think we’re ready. We just need to be willing. Reading Kristen’s story will make you feel braver and eliminate a lot of the excuses we like to hide behind. Read it. I dare you. OK, are you ready – give us five minutes on the word MESS. So many days feel like trying to hold back a crashing tide of chaos. There are the shoes I just put away back out on the floor piled up in a heap of colorful plastic corpses. There are the tiny ceramic tea cups all the way from Christmas in South Africa. There are the ketchup stains and stickers and socks that never, ever, not once make it to the laundry basket. My life is a mighty, irresistible rip tide of mess and there are days I stand on my tippy toes with squawking voice trying to order my way out of it. Like I can command, cajole, coax the three who bear my name and my DNA to somehow magic themselves into caring that they put the cap back on the toothpaste. They don’t care. They’re too busy making life. All around me. A whirlygig of crazy, uncontainable, uncontrollable life. I can’t keep waiting for it to sit down and pay attention and be quiet. I need in. Not out. Deeper into life and exploring and listening and laughing and nodding and following them and the God who built them knee bone to hip bone to spine to big, bright, eyes – always believing that there is hope after the word, Yes. 1. Bacon for dinner-Yes, please! 2. “A whirlygig of crazy, uncontainable, uncontrollable life.” Life isn’t meant to be perfect…it’s meant to be lived. And living is messy, no matter what the world says. 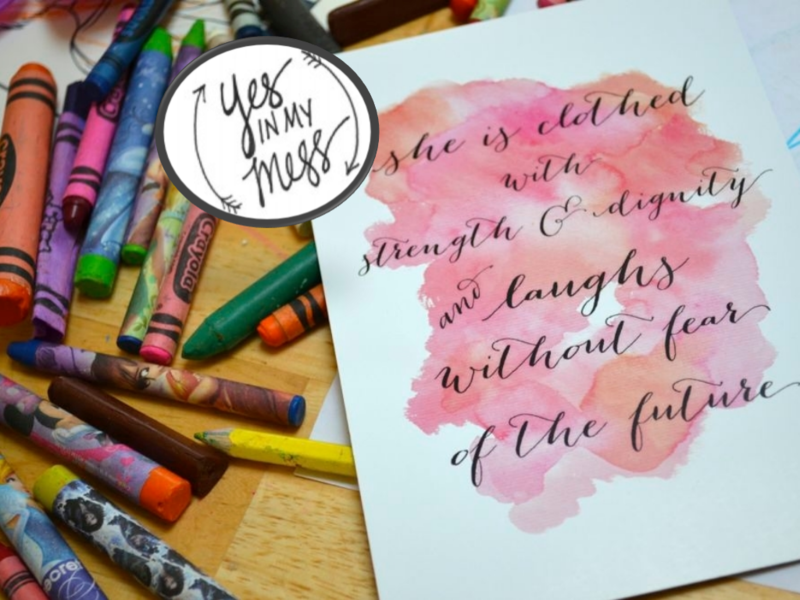 Thanks for the encouragement to embrace the mess! The last paragraph…big breath now…it’s time to live yes. live hope. live like it’s ALL real. LOVE IT! When we got our dog 11 years ago, she was a puppy. We didn’t have to worry much about messes (amazing, I know!). A good friend of ours that had a couple of dogs and a pup her age kept her until we moved into our home (about a month). He took her out with the other dogs and she learned how to “go” outside instead of inside right away! She never chewed any shoes or damaged anything of ours. It was wonderful! One day, when the nest is empty, you’ll long for the mess while at the same time breathing a sigh of relief that your husband no longer accuses YOU of leaving things out or putting them back in the wrong place ;). Oh my goodness, I just started reading “Rhinestone Jesus” this afternoon. I’m loving it! I finished Kristen’s book earlier this week. Such an amazing story. I am so thankful for her yes, inspiring so many to take that step of faith too. Lisa Jo, You have inspired me to start a blog! This is my first week with a blog instead of just posting it in the comments! Thanks so much for your inspiration. I started using fiveminutefridays as a test to see if i could commit to writing for 5 minutes each week. I’m so excited to share! Oh exciting! Welcome Brave Amanda! That about says it. I feel 100% out of control today. My skirt’s too tight, my new shoes, which were meant to be a salvation to my Flinstone feet, are chafing my ankles and, I think, making my right little piggy toe numb. So I feel fat, a big ol’ mess, AND I’m hungry, but I don’t want to eat, because, you know…I’m fat. I just read that on FB. It sounds like a Dolly Parton song. I kind of love and hate it at the same time. It sounds all desperate-middle-aged lady on one hand and deep country on the other. And with my numbing-out feet, I gotta say, I’m not a fan of keeping the heels high. I’m ready for nun shoes: Thick soles (I just typed “soul” by accident. Hmmm…), black, screaming practicality. Wow, I think I need a thicker soul. If I had a thicker soul, maybe messes wouldn’t undo me. As it is, I mean, I’m way OCD about messes. BJ calls me Monica, from “Friends,” because I’m always straightening up, but have you SEEN the way he attempts to make a bed? It’s sorry stuff. And when he emerges from my bathroom, I am convinced he’s been in a fight–and the bathroom is the biggest, wettest loser, caked up with toothpaste on the floor and dribbling into the sink, water EVERYWHERE and, shockingly, the toilet seat up and open like a mouth ajar. You know when you are in the card store searching for the right card, and you pick up the 25th one and -boom- there it is.. exactly what you wanted to say? Only you didn’t know just how to say it. But there it is the exact perfect description of what you feel. “My life is a mighty, irresistible rip tide of mess and there are days I stand on my tippy toes with squawking voice trying to order my way out of it. Like I can command, cajole, coax the three (two in my case) who bear my name and my DNA to somehow magic themselves into caring that they put the cap back on the toothpaste. They don’t care. They’re too busy making life. This is EXACTLY what I feel and you said it beautifully! I admit, I often skip YOUR writing to just get my link up posted. I’m sorry. Today, I didn’t just scroll past and I was blessed in your words and really enjoyed them. Thank you for sharing them amongst the Twitter party and all! Thank you for bring brave, for writing, for encouraging others and for providing a fun place to gather online and share our stories. Thank you for the Mess prompt. It kind of messed me up, but in a good way. God’s timing is funny. Just as I was mentally prepping to write, and recognizing that I had entered giveaways for this book but wasn’t really sure my heart could read it write now, I found out I won a copy. I embrace messiness. Growing up, I was always getting in trouble for having the messiest room in the house. I just saw no point in keeping it clean and orderly when I knew I would end up messing it up again in no time. Now that I’m what people like to call an “adult,” I try to keep my house clean, but it’s a constant struggle. I just don’t care that much about things being perfectly put away and organized. If I know where to find something, then I’m doing alright. In fact, I think I said just the other day that if my house is perfectly tidy, that means I’m either avoiding something important or I’m missing out on life. What a wonderful idea, to write for just five minutes then click Publish. I am a perfectionist, so this will be out of my comfort zone, but I hope to participate next time.